Tim is from Oregon. He explains it is such a good place to live in the U.S.
Tim: Hey, how's it going? Todd: Doing pretty good. Could you introduce yourself please? Tim: Yeah, I'm Tim Peterson. I'm from Oregon in the United States. Todd: Oh, nice. You're from Oregon. Todd: OK, and were you born there? Tim: Yes, I was born there. Todd: Oh, really? Did you ever live in any other states or..? Tim: I lived in Wyoming for a really short time. Tim: And, I've lived in California for a short time too. Todd: OK. Of those three states, which one is the best? Tim: It's got lots of nature. 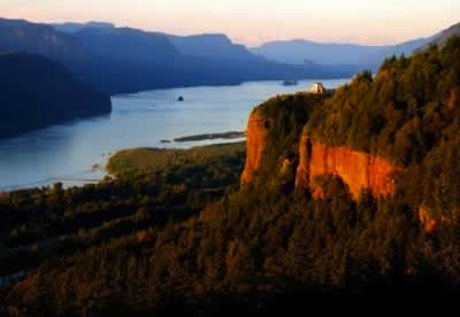 It's really beautiful, I think in the United States probably Oregon and Washington state are the most beautiful. Tim: Lots, lots of green stuff and the lots of nature. Good mountains, good streams, good water. Todd: Wow! Well, what about Wyoming? Tim: Wyoming is nice but it is really dry. And it's really sort of dark. Todd: Oh. OK. Wow, so when you grow old and retire someday, you're a very young guy but when you grow old, would you like to live in Oregon? Tim: Ah, Oregon or Washington probably. Maybe Alaska. Todd: Man, the Golden State. Tim: Yeah, too many people. Todd: All right, Yeah. OK. Thanks a lot. [How's it going?] Doing pretty good. She is doing pretty good at her new job. I am actually doing pretty good now. Please introduce yourself to the class. I always hated introducing myself in school classes. I lived in Wyoming for a really short time. She was only here for a short time before she left again. We lived in a hotel for a short time at first. Of those three states, which one is the best? Of those restaurants, which is your favorite? Of those countries, which was the most beautiful? Oregon and Washington State have lots of nature. There is lots of nature around the school. Does your area have lots of nature? Can you me to your friend? It only takes a to get there by bus. There is a lot of around our cabin. Are you doing in your new place? dresses, I like that one the best.